Mouse anti Human BIRC2 antibody recognizes the baculoviral IAP repeat-containing protein 2, also known as IAP homolog B, cIAP1, RING finger protein 48, TNFR2-TRAF-signaling complex protein 2, apoptosis inhibitor 1 or inhibitor of apoptosis protein 2. The protein encoded by BIRC2 gene is a member of a family of proteins that inhibits apoptosis by binding to tumor necrosis factor receptor-associated factors TRAF1 and TRAF2, probably by interfering with activation of ICE-like proteases. This encoded protein inhibits apoptosis induced by serum deprivation and menadione, a potent inducer of free radicals. Alternatively spliced transcript variants encoding different isoforms have been found for BIRC2 (provided by RefSeq, Jan 2012). 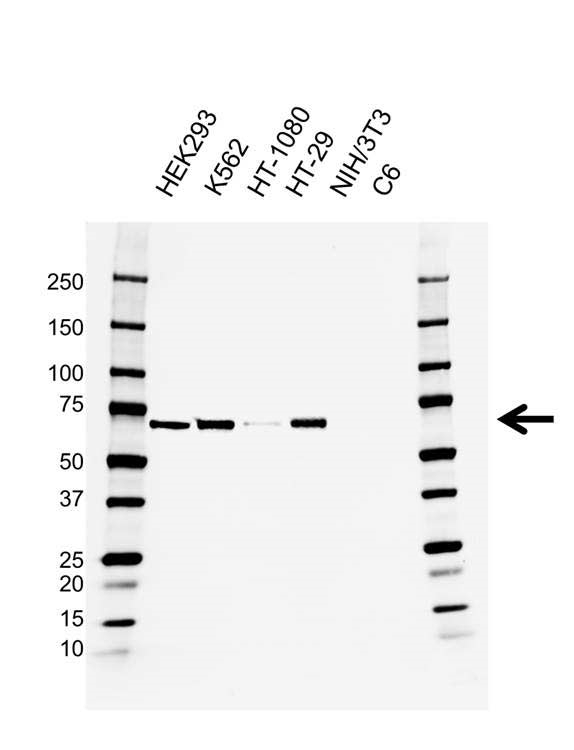 Mouse anti Human BIRC2 antibody detects a band of 70 kDa. The antibody has been extensively validated for western blotting using whole cell lysates.